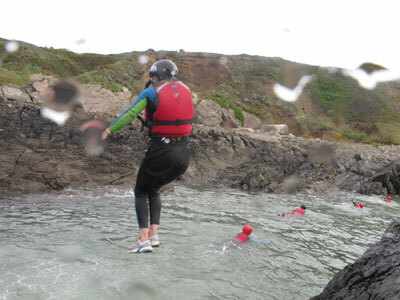 Coasteering is one the most challenging and thrilling activities that we offer. Our coasteering trips are adrenaline packed; with progressive jumps, sea caves, and turbulent swims that are guaranteed to get your heart racing! 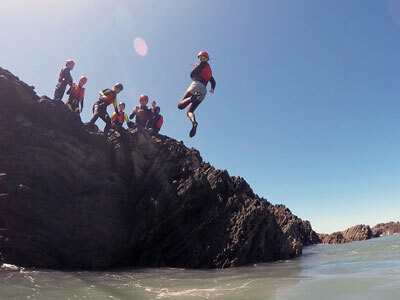 You can enjoy the spectacular coastal scenery of North Devon whilst experiencing the high energy environment that is the ‘impact zone’ – where water, waves, rocks and gullies collide to form the ultimate coasteering challenge. If you like the Coasteering then you might also like…. We know that all stag do’s aren’t the same, so you can add to Coasteering to get your ideal combination. In addition to your organising single activities we can also arrange transport, food throughout the day, restaurants for the evening, clubs and accommodation. Just let us know any extra requirements when you contact us. 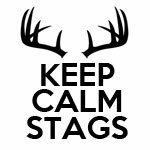 Or check out our packages to see some of the carefully selected stags days and stag weekends we have put together.